One of the best parts of travelling is experiencing local flavours. With every bite I often dream of dishes that I would want to make upon my return home. This was no different during my recent trip to Hawaii. I came home to the cold of NY and wanted nothing more than to bring the tropics with me. To share a small slice of my trip, I’ve created this Hawaiian fried rice recipe. Hawaii has similar flavours to most other tropical countries. What really stood out for me was their delicious macadamia nut. They are grown in Hawaii and can be found in many dishes, most notably the macadamia crusted mahi mahi. I also enjoyed my fair share of them covered in chocolate. With that said, the flavours of this rice are not very unique to Hawaii rather they inspired by a tropical vacation. My creamy coconut rice is fried with Jamaican jerk spices, pineapple, peas, and macadamia nuts. This recipe is both sweet and savoury making it uniquely delicious. Ask Alexa to play beach wave sounds for ultimate enjoyment. Rinse rice in a large bowl with cool water until water runs clear. Drain rice. Place rice, coconut milk, 1 1/2 cups of water and a pinch of sea salt into a medium saucepan. Bring to a boil, cover and reduce heat to low. Cook for 25 minutes. Remove from heat and allow to sit covered for an additional 10 minutes. Fluff with a fork. Rice can be prepared a couple days in advance. 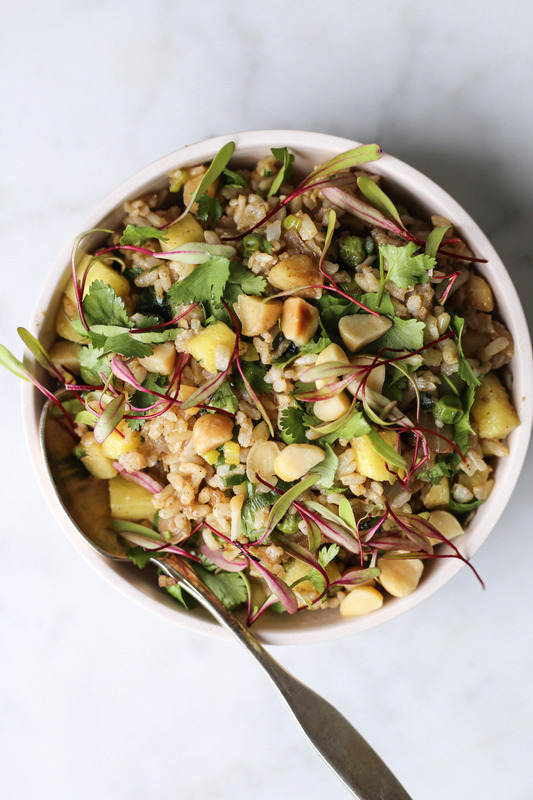 This entry was posted in Starters/Sides and tagged brown rice, coconut milk, hawaii, holiday, jamaica, macadamia nut, maui, pineapple, tropical, vacation, Vegan, whole foods, whole grains. Bookmark the permalink.